The new bullpen terraces in center field. Photos by Jason Schott. 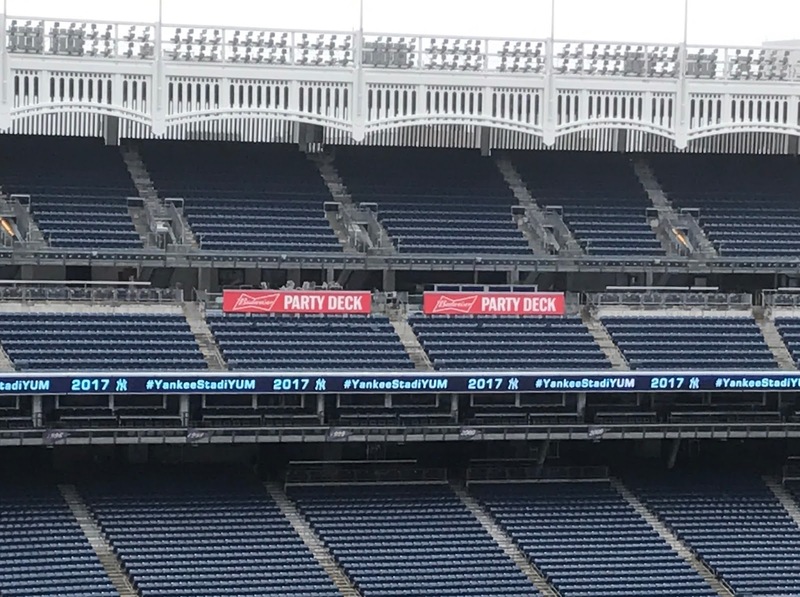 The Yankees have conducted surveys of their fans the past few seasons, and many of their ideas on how to improve the Yankee Stadium experience are reflected in the enhancements for the 2017 season. On Tuesday, there was a media tour of the new stadium features, including the bullpen terraces and the Sunrun Kids Clubhouse. The Yankees also have an increased number of value-price single-game ticket options, as they introduced two new offers, the Pinstripe Pass ticket, which starts at $15 for select games, and a Grandstand Level ticket starting at $10. The Pinstripe Pass ticket is a general admission standing room only ticket which also includes one drink, and the choices include a 12 oz. domestic beer for those age 21 and over with valid ID, a Pepsi product or a bottle of Poland Spring water. Fans purchasing a Pinstripe Pass will be able to enjoy the game from non-assigned standing room locations throughout the Stadium or at any of the recently announced social gathering locations listed above. Pinstripe Pass quantities and prices will vary for each game. For more information regarding the Pinstripe Pass, please visit www.yankees.com/pinstripepass. Additionally, for every 2017 regular season home game, the Yankees will offer $10 Grandstand Tickets in select Grandstand locations. Quantities available will vary for each game. SUNRUN KIDS CLUBHOUSE: The Sunrun Kids Clubhouse will be Yankee Stadium’s first-ever children’s zone. Shaped like a mini-baseball field with a soft artificial surface, the 2,850-square-foot area is located on the 300 Level in right field and outfitted with Yankees-themed playground equipment, including oversized baseballs, bases and baseball cards, a 6-foot-high replica World Series trophy and interactive exhibits. Parents can join their children on the play area or choose to oversee them from a nearby dugout. Television monitors will ensure that no one misses any game action. On warm days, a retractable shade can be extended to cover the play area. The Sunrun Kids Clubhouse also includes two family restrooms equipped with changing tables. Nursing mothers will have additional private space, including lounge chairs, a television and power outlets for those using electric breast pumps. MASTERPASS BATTER’S EYE DECK: Located on the 200 Level in center field with a clear, sweeping view of the entire Stadium, the Masterpass Batter’s Eye Deck has been expanded to 3,500 square feet and includes drink-rails overlooking the field. This outdoor gathering space will feature craft beers, cocktails and a large selection of food options. 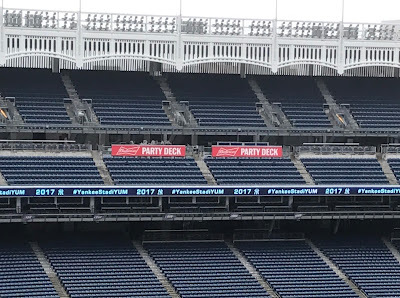 BULLPEN TERRACES: Frank’s RedHot Terrace (overlooking the visitors bullpen in left field) and the Toyota Terrace (overlooking the Yankees bullpen in right field) are open-air social gathering areas on the 100 Level. Each terrace features its own specialty food and drink options. Drink-rail locations at the landings will have power/USB outlets. As a result of this reconfiguration, all obstructed-view seats in the Bleachers have been removed. BUDWEISER PARTY DECKS: Located in Sections 311 and 328, Budweiser Party Decks feature shaded stand-alone bar areas serving beer, cocktails and food. Drink-rail and barstool seating provides fans a relaxed and casual setting from which to enjoy sweeping views of the field and game action. AT&T SPORTS LOUNGE featuring DirecTV service: The new AT&T Sports Lounge featuring DirecTV service at Section 134 on the Field Level includes a full bar with craft beers and cocktails. Tables, stools and large-screen televisions tuned to the Yankees broadcast and other live sporting events provide a sports-bar atmosphere on the Stadium’s main outdoor concourse in left field. Additionally, power/USB outlets are available for charging phones or tablets. Grilled fresh every time, Jersey Mike’s authentic cheese steaks are sure to please. Hearty, with tender meat and melted cheese, it’s no wonder they’re a crowd favorite. AT BEN & JERRY’S SCOOP SHOP (Sections 125 and 318): Flavors include: Vanilla, Chocolate, Cherry Garcia, Strawberry Cheesecake, Totally Baked, Frozen Flakes, Fruit Loot and Tonight Dough. New York’s own Blue Point Brewing Company will be featured in various concession stands and bars throughout Yankee Stadium. Ideal for both alcoholic and non-alcoholic beverages, SPLASH Premium Mixers is a new brand of cocktail mixers made from natural ingredients. SPLASH custom designed three original signature cocktails exclusively for the Yankees — the "Grand Slam", "Big Apple" and "Triple Play" — in addition to providing their classic Margarita, Mojito, Cosmopolitan and Moscow Mule mixers. Each SPLASH flavor is designed to satisfy a sophisticated palate, while minimizing calories and unnecessary sugar.